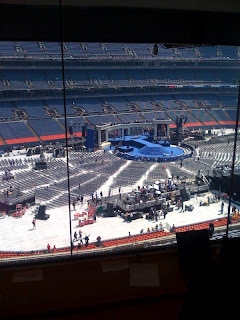 Today, August 28, 2008, is the fourth and final day of the Democratic National Convention and I am high above Invesco Field in the press box as Stevie Wonder practices his performance for later tonight. 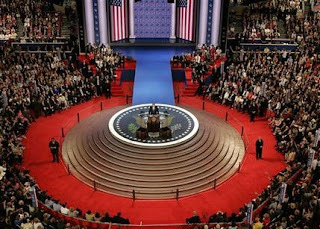 To be honest with you, the convention stage reminds me some of the stage George W. Bush used to accept his Party's nomination at the 2004 Republican National Convention. That's what the stage at field level resembles...columns and all. And now, Pat Pullar has arrived with her camera and provides us with pictures of Invesco Field and the satge where Barack Obama will accept the Democratic nomination for president.